Welcome to the four hundred and second of my blog interviews with novelists, poets, short story authors, biographers, agents, publishers and more. Today’s is with Hersilia Press publisher Ilaria Meliconi. A list of interviewees (blogged and scheduled) can be found here. If you like what you read, please do go and investigate further. Morgen: Hello, Ilaria. Can you please briefly explain the structure of your publishing house… perhaps who’s involved along the process of an acceptance to the book / story being published. 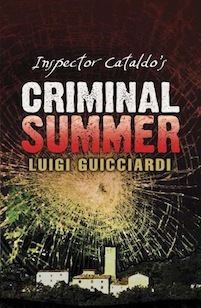 Ilaria: I publish Italian crime fiction including translations of books by Italian authors and English books set in Italy. I’m the publisher and owner, so I am the person who looks for new books to publish and makes the final decision on whether to make an offer for the rights acquisition. For translations, when I find a suitable book I send a copy to readers, who are fluent Italian speakers living in the UK, and they give me their opinion on it. On the basis of their reports and my own judgement I then make a decision on whether to make an offer for the translation rights. For English manuscripts I usually work with agents (meaning the manuscript has already had a first round of editing) but may suggest some further structural editing. All manuscripts are copyedited before being published. Morgen: Now I wish I spoke Italian, it’s sounds a great process to be involved in (hard work of course but…). The $64,000 question: out of all the submissions you receive, what makes a book / story stand out for all the right reasons? Ilaria: Good writing is essential, and I really don’t like big words used for their own sake and affectation. It is rarely appropriate to the crime genre and if an author can’t use different styles in different genres then that’s something they have to work on. I like an unusual story that makes me believe I know what happened and it turns out it was something else, and a story where the explanation of some event or behaviour is not obvious. A good crime story doesn’t need a troubled, alcoholic and divorced detective to work, but it can work even without a professional detective. What makes people snap and kill others in a particular situation is fascinating to investigate. Ilaria: Stories that follow a fad, Templar knights mysteries and unoriginal titles that copy other, more famous ones. Morgen: And possibly better written. How can an author submit to you? Ilaria: Just email a book synopsis and the first chapter to submissions@hersilia-press.co.uk, with a short paragraph about yourself. Ilaria: Do write the submission as if you were applying for a job, not writing to your sister. Use paragraphs and don’t use text speak in the submission, even if it’s an email. Do read the information on my website before sending a submission. Don’t email me submissions for genres I don’t publish. Don’t ask for advice on how to get published, or a free publishing consultation – you wouldn’t ask your electrician to work for free! Morgen: Common sense, you would hope. To your knowledge, have any of your published books / stories won or been shortlisted in any competitions? Ilaria: I try to select good quality books so many of them have won or been shortlisted in competitions. 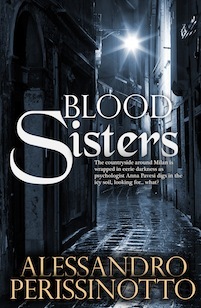 The first two books in the Commissario Cataldo series by Luigi Guicciardi have been shortlisted for the Premio Scerbanenco, Blood Sisters by Alessandro Perissinotto has won the Premio Grinzane Cavour in 2005 and the Premio Camaiore in 2006. 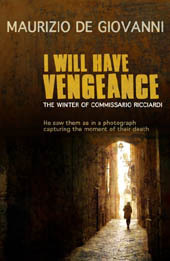 Maurizio de Giovanni, author of I Will Have Vengeance, has won the Premio Camaiore in 2011 and has been shortlisted for the prestigious Premio Scerbanenco in 2010; it has also been shortlisted for the CWA Ellis Peters Award for historical crime fiction and the CWA International Dagger for translated novels. Morgen: That’s fantastic. I don’t know the aforementioned Italian awards (sorry about that) but the CWA (Crime Writers Association) is highly respected here. What do you feel about an author writing under a pseudonym? Do you think they make a difference to their profile? And would you recommend an author writing under different names for different genres? Ilaria: I do. When an author writes in more than one genre, it helps readers identify what type of book they are looking at, even if the external layout should be clear enough. It might also help an author get “into character” when writing. Morgen: I’d not thought of it like that, the ‘getting into character’. Quite a few household names write under pseudonyms for their different styles, Ruth Rendell = Barbara Vine, Joanna Trollope = Caroline Harvey to name a couple. Another semi-priceless question: do you think an agent is vital to an author’s success? How would you suggest an author gets one? Ilaria: It’s vital that a manuscript is professionally edited – and having an agent reassures a publisher this has been done. If you can have your manuscript professionally edited (not just read by a friend or relative who likes books) and don’t have an agent, some of the work has been done but it is still more difficult to place it with a publisher. Lot of publishers don’t accept manuscripts from unagented authors. Morgen: I’ve learned from this blog how many authors there are out there and most are trying, or have tried to get an agent or publisher but we all know it’s the profession for testing your determination. 🙂 Now for, in theory, a simple question: what’s your opinion of eBooks, do you publish them and do you read them? Ilaria: I publish them and read them, and love them! I believe eBooks and paper books can easily coexist. Morgen: Oh, so do I. Most of the authors I’ve spoken to read both and can’t imagine being without them. Like me, they read paper at home but love the fact that they can have hundreds of titles with them if they go away. Ilaria: eBooks focus solely on the content, p-books are visual and tactile objects so the physical experience is also important (e.g paper weight and colour, cover). Almost all my submissions are read on an eBook reader. The most important next step for the technology is to become standardised and more reliable: at present, even the same file isn’t rendered in the same way in all eBook devices. This is something that technology companies have to work on. And in my opinion DRM will have to be linked to a digital signature, allowing people to read the book they have legally bought onto as many platforms as they like and own (e.g. eBook reader, mobile phone, computer screen). Morgen: It’s certainly a learning curve. I held a 2-hour talk at one of my writing groups on Thursday evening about creating eBooks (with a 9-page handout) and even those with little computer knowledge were less daunted by it (although most said they’d like to bribe me with cups of tea and biscuits to go to their houses when they come to put their eBooks together). Poetry and short stories are, in my opinion anyway, the two most hard done by genres… what do you see as the future for them? Do you think the eBook revolution will help given that eBooks seem to be getting shorter? Ilaria: I think there has been a revival of the short story. A number of publishers are taking advantage of the e-format and are publishing free short stories on their website (Hersilia Press included). There has also been a huge growth in flash fiction which I like very much. Flash fiction is probably among of the hardest type of writing, it needs a lot of work and a lot of honing down to the very essential: it is the best way of showing not telling, where you can let your reader imagine most of the story. Morgen: I’ve been writing a story a day since May 1st (for Story A Day May then 5pm fiction, as well as one a week for Tuesday Tales) and because of the timing (or lack thereof), they’ve turned out to be flash fiction so it’s what’s coming out at the moment, but I love them so… Apart from the stories in your publications, what do you like to read? Any authors (including those you’ve published) that you’d like to recommend? Ilaria: I try to read something very different just to switch my brain off crime fiction, so I turn to popular science and academic essays – my training is in science so a part of me wishes to keep up with the recent research (but I don’t usually succeed). Morgen: But presumably science comes in really handy with the technical side of crime writing. Are you involved in anything else writing-related? Ilaria: Yes, I help running a writing group called Group 2012, with Blackwell’s bookshop in Oxford and The Oxford Editors. It started in January 2012 and it’s gone from strength to strength: we have a fantastic group of writers. We meet once a month, and usually have an author talking to us about their experience, while in the second half of the meeting we concentrate on writing, with exercises and manuscript feedback. Have a look at www.group2012.wordpress.com. Morgen: I have, and sadly your group clashes with one I belong to (Towcester Writers Group), the third Wednesday of the month. 😦 I’m not long back from volunteering near you actually, at the first Chipping Norton Literature Festival. I was in the green room part of the time which was fantastic. I hope to be involved again next year (and others in between). 🙂 What do you do when you’re not working? Ilaria: I like to cook and eat, and do manual things to try to use the other parts of my brain: gardening and pottery (with rather poor results in both). Morgen: Oh dear. We’ve had a lot of warm and wet weather here in the UK so the garden’s bound to get out of hand (that’s the excuse I’m using anyway). Well, thank you so much Ilaria, lovely to ‘meet’ you today. Ilaria Meliconi studied astrophysics at the University of Bologna, then an MSc and a DPhil (or a PhD for non-Oxonians) in history of science at Oxford. She fell into publishing, working first on the journal of a learned society and then moving on to managing various journals and commissioning books. After a decade of experience she wanted to recommend her favourite crime fiction books to her English-speaking friends, and found they were not available yet, so decided to do it herself and founded Hersilia Press.